Review the tendencies for using in, on, and at. Then do the practice activity. 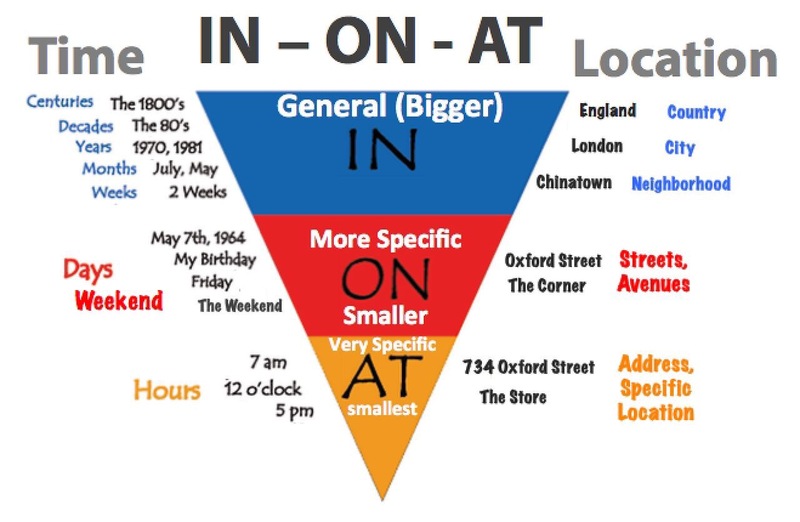 This chart shows some of the tendencies for using in, on, and at. Place: We use in for large places (countries, cities, towns, states, provinces, districts, regions, etc.). We also use in for specific rooms (the conference room, the cafeteria, etc.). Time: We use in for long periods of time (eras, centuries, decades, years, months, seasons, etc.). Place: We use on for streets, avenues, roads, highways, etc. Time: We use on for individual days (April 7, Christmas, Thursday, etc.). We also say on the weekend in American English (at the weekend in British English). Place: We use at for specific locations (the bank, work, home, the store) as well as events (a party, a convention, a conference, etc.). Time: We use at for specific times (7 a.m., lunchtime, midnight, dawn, etc.). Fill in the blanks with either in, on, or at to complete the sentences. Also see this in vs. on practice exercise. 1. Let’s talk about this ___ Monday morning. 2. We’ve had these problems ___ the past. 3. ___ the early 1990’s, the economy was fairly strong. 4. Several of our competitors are also based ___ the area. 5. Alex showed me around the office ___ my first day at work. 6. Do you have some time to talk, or did I catch you ___ a bad time? 7. ___ first I was confused. 8. I always try different foods when I’m ___ another country. 9. We received the bill ___ March 18. 10. Greg started his first business ___ the age of 21. 11. Bryan was ___ home when he got the call. 12. There was a major accident ___ the highway this morning. 13. ___ the future, more of the workforce will work remotely. 14. I left my laptop ___ the conference room. 15. We’ve accomplished so much ___ a two-week period. 16. Many companies spend a large portion of their advertising budget ___ December. 17. Let’s get started ___ 8 a.m.
18. We’re always extremely busy ___ the end of the fiscal year. 19. If we rented an office ___ the suburbs, it would be cheaper. 20. We faced many challenges ___ 2013. 21. Did you have to work ___ Labor Day? 22. We were ___ work until almost 9 p.m. last night. 23. Our manufacturing facilities are located ___ a rural area. 24. There is a fantastic Italian restaurant ___ the corner. 25. In this area, hotel rooms are usually much more expensive ___ the summer. 26. The post office is ___ second avenue. 27. I’m pretty sure I submitted those reports ___ Wednesday. 28. I worked ___ a private bank for a few years. 29. What time did they drop you off ___ the airport? 30. Ricky often reads ___ the evening. 31. I have to run some errands ___ lunchtime. 32. Jim wrote an email to the entire company ___ his last day. 33. What restaurants did you go to ___ Hong Kong? 34. What side of the road do they drive on ___ Jamaica? 35. I saw some old coworkers ___ the sales conference. 36. I was still working ___ midnight. 37. I’m too tired to be productive. Let’s finish this ___ the morning. 38. Mike went to a big party ___ New Year’s Eve. 39. This is the only textile factory ___ the state. 40. It gets very cold here ___ the north. 41. The early 2000’s was a difficult time for me. ___ that time, I was making very little money. 42. Do you want to stay ___ the city this weekend? 43. I’ll stop by your desk ___ the end of the day. 44. The Industrial Revolution started ___ the 1700’s. 45. Paulina has accomplished a lot for someone ___ her early 30’s. 46. I do my best work late ___ night.